↑ For example, Richard Abels says that "Historians are in basic agreement that the original Chronicle extended to at least 890." 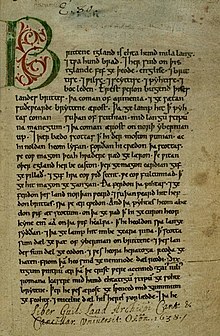 Keynes and Lapidge suggest that "the return of the Vikings to England appears to have occasioned the 'publication', in late 892 or early 893, of the Anglo-Saxon Chronicle". See Abels, Richard (2005). Alfred the Great: War, Kingship and Culture in Anglo-Saxon England. Longman. p. 15. ISBN 0-582-04047-7. See also Keynes & Lapidge, Alfred the Great, p. 41. ↑ Swanton, The Anglo-Saxon Chronicle, pp. xxi–xxviii. ↑ See P. Wormald, "Alfredian Manuscripts", p. 158, in Campbell & al., The Anglo-Saxons. หน้านี้แก้ไขล่าสุดเมื่อวันที่ 26 สิงหาคม 2561 เวลา 13:44 น.